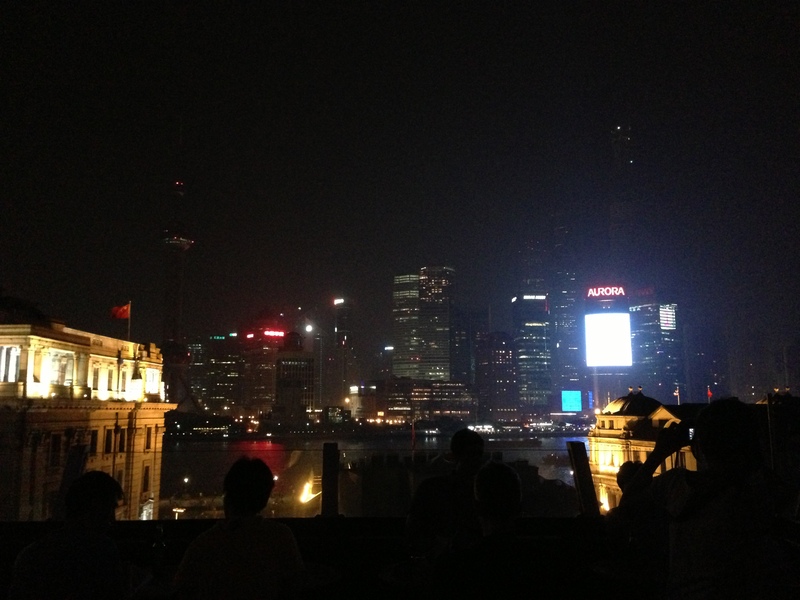 The Bund is an iconic part of Shanghai. The buildings on the Eastern Side of the Huangpu River were built in the late 19th and early 20th century. They were originally the property of banks and in a couple of cases, clubs. The Chinese government confiscated them in the 50s, but in the last 30 years the buildings have started to return to their former glories. They’ve become high-end fashion houses, top-end hotels or headquarters for Chinese and foreign banks – and Bund now looks awesome. When a wind is blowing the Chinese flags that must be mandatory create quite a spectacle as they proudly on top of these stone beauties. The Bund is about walking along the promenade alongside the Huangpu and looking East to the skyline of the Pudong. Day or night this looks fantastic. If you’ve got plenty of coin it can also be about eating and drinking very well, but gees – you’ve got to have the coin. Tony from Toowoomba came to Shanghai by train from Beijing and I pulled up a stool at the Waldorf Astoria’s legendary Long Bar to wait for him. The Waldorf Astoria has restored the old Shanghai Club building into a spectacular hotel. 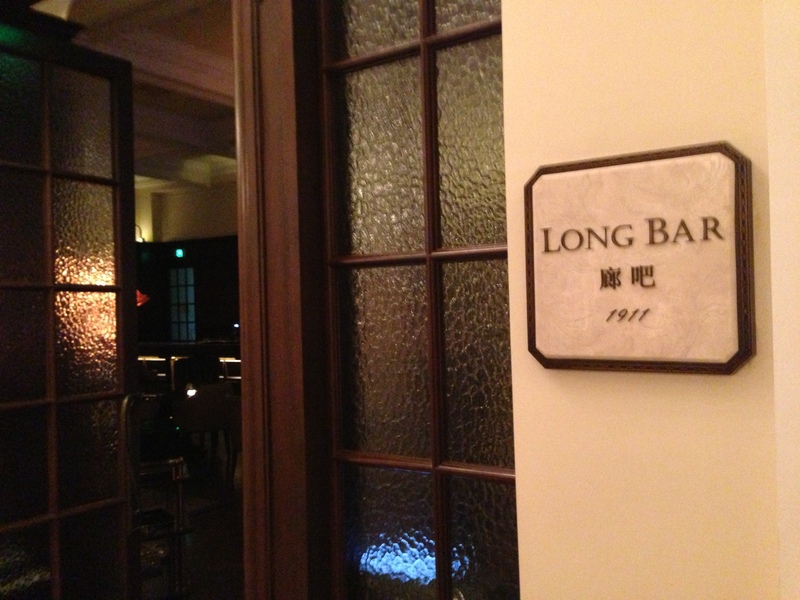 The Long Bar was famous for being, well, long. Originally 110 feet long, I’m not sure if it still that long, but it is still probably longer than the bar at the Railway Hotel, West Melbourne. It is a fine looking place and you can’t last 5 minutes without a very keen member of staff wanting to tell you the history of the Long Bar. In a way it was lucky so many people wanted a yarn – because at $12 a Tsingtao stubbie – this ain’t cheap drinking. TfT arrived and we had our most expensive beer in Shanghai together. Great place for one drink and look – but that’s it. Our dinner venue was the Bund Brewery. 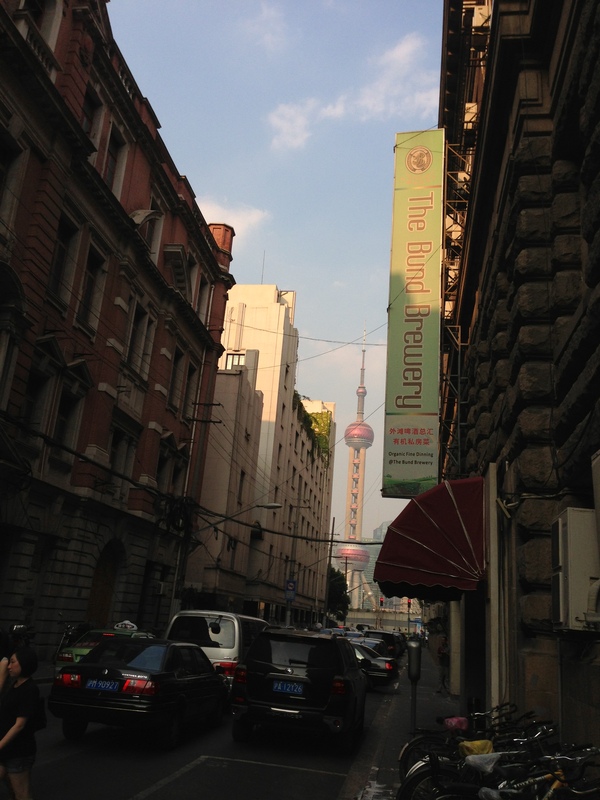 The Bund Brewery is half a block from the waterfront and the Oriental Pearl Tower looks great from the street. There is a reasonable space inside with a pool table, plenty of seating and some large screen TVs. 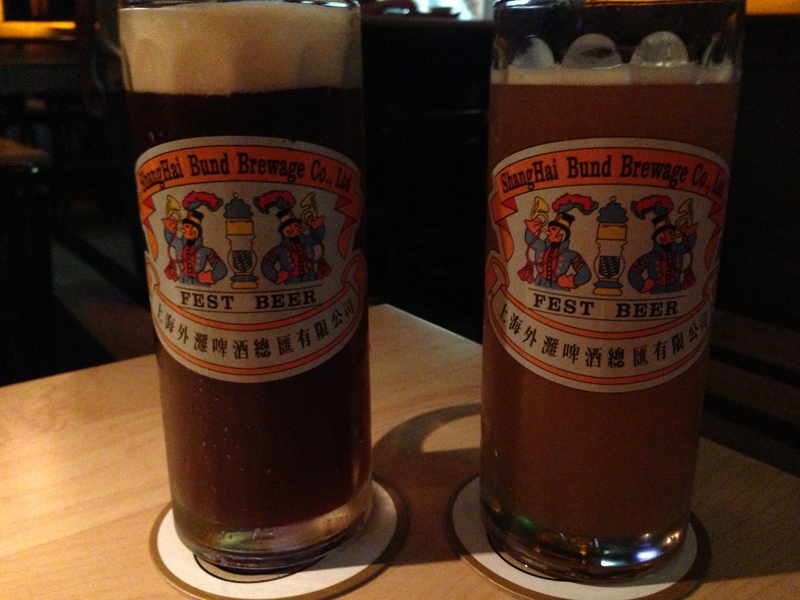 We opted to order the entire Bund Brewery range in our opening shout with a pale ale and a dark. The glasses look magnificent, but that is about the highlight. The pale, whilst cloudy, was pretty underwhelming without any discernible flavour. The dark was OK – a lttle rough, which isn’t a bad thing for a dark, but again not particularly distinctive. Apart from some soy fried fish, the food was also disappointing. At 8.30pm on a Thursday – you might have expected a crowd – but this place was pretty quiet. Go to get your Untappd uniques – but that’s it. 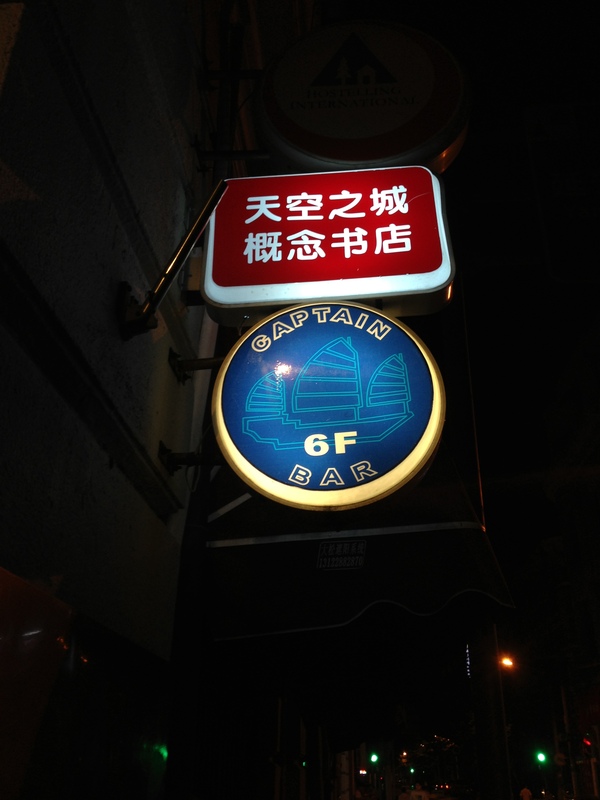 Our last stop was Captain Bar. This is a rooftop bar on top of a hostel, which is a remarkable find in amongst such high end accommodation. 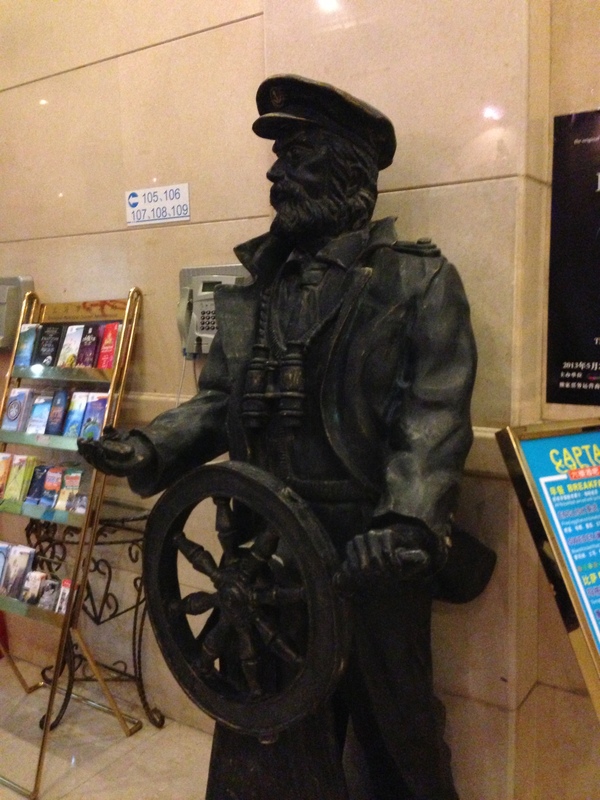 You pass by the eponymous Captain on the way to the clapped out elevator. You hop out at the fifth floor and walk up a set of metal stairs and you enter one of the darkest bars of all time. It is a shame, because the inside of Captain Bar is designed to resemble an old boat. The main source of light is a set of illuminated tapheads that guide you to the bar. The star attraction of Captain Bar is the outside drinking area with its views of the Huangpu River and the Pudong Skyline. TfT and I grabbed a couple of tankards of Tsingtao (60RMB or $10.60) and took in the view from Captain Bar, which is el primo and just about justifies the price. At 11pm, it was still a ridiculous 35 degrees.